Of all the issues facing the mountain bike industry, counterfeit products don’t seem to receive much attention. This is changing thanks to a mammoth new investigation by Carlton Reid and industry magazine Bikebiz, published over 25 separate articles.The report sheds new light on the extent of piracy, and it’s a fascinating – if weighty – read. The clear message is that even as manufacturers are forced to plough even more resources into fighting counterfeiting, it isn’t going away. Nothing fishy about this. No siree. The report focuses on fake, unlicensed products which are passed off as genuine articles from big name manufacturers like Specialized, Oakley and Cinelli, and sold by a number of direct-to-consumer Chinese online retailers, such as Alibaba, Aliexpress, and DHGate, (whose tagline is “Buy Smart. Buy Direct”). Counterfeit products also turn up on more familiar platforms like eBay and Amazon. 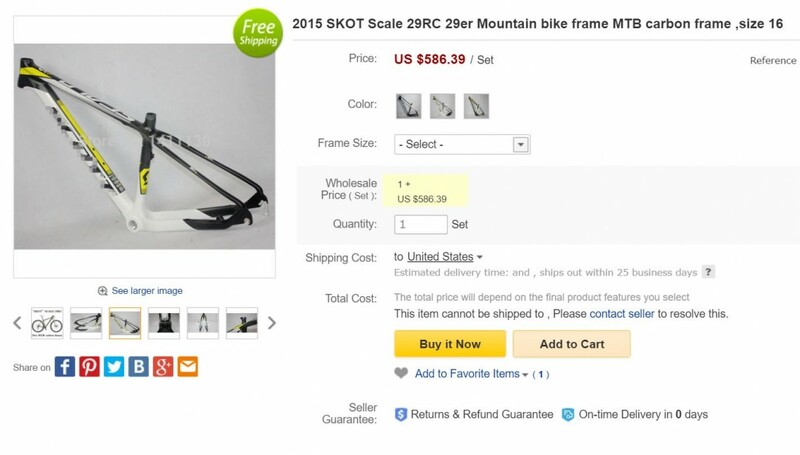 What these sites all have in common is the anonymity they give their retailers, and the ability to evade the eyes of copyright lawyers by simply describing items as “bicycle frame” or “men’s riding top” and letting the accompanying pictures of a Dogma F8 or Sky kit do the talking. Counterfeiting isn’t just limited to “Chinarellos” but also extends into parts and clothing. However piracy is particularly prevalent with high-end carbon road frames. The premium price of the genuine frames comes mainly from the way the layers of carbon are built up, with expensive unidirectional fibre used in place of cheaper woven matt, and many stages to the manufacturing process. After completion the frame is extensively checked for defects such as voids or delaminations which could affect its integrity. None of this work is immediately obvious from the exterior, and detecting an inferior copied product might only be possible by expert examination, such as measurement of tube profiles. A factory making carbon frames is also relatively easy to set up, making it an ideal venture for a fly-by-night operation. One persistent rumour about knock-off goods is that they come out of the same factories as the genuine article, made by a notional “third shift”. One persistent rumour about knock-off goods is that they come out of the same factories as the genuine article, made by a notional “third shift”. Bikebiz give this a thorough debunking, pointing out that there are huge numbers of factories serving the bicycle industry across Taiwan, China and further afield. At the top end are long-established firms (Giant is probably the best-known example), supplying some of the world’s most prestigious bicycle brands, who have too much to lose and nothing to gain by going rogue. At the bottom are operations which are little more than flying factories, putting together fake products as quickly as possible with scant regard for their workers’ welfare, then vanishing as soon as the lawyers close in. It’s this bottom tier that are mostly responsible for the flood of forgeries. So why do so many consumers maintain that the fake frames are produced by the same factory as the originals? The answer is probably due to the fact that some frames sold by bike brands are “open mold”, created using open source patterns and baked in a mould that any manufacturer can rent. Some brands deliberately muddy the waters by making inflated claims for the R&D work that goes into these products. Bikebiz quote one manufacturer’s website which says “countless hours” were spent “in the wind tunnel to create these aero-optimized tube shapes”. What they actually mean is “countless minutes were spent picking this frame out of a catalogue”. But provided they’re not dressed up in another manufacturer’s branding, open-mold frames don’t break any laws, and if they’re made properly they’re perfectly fit for purpose. Counterfeit frames can be difficult to detect. For other items such as clothing, the fakery is much easier to spot, as it tends to involve printing another manufacturer’s logos onto cheap generic clothing, with the counterfeiters often adding their own touch of design flair. Team kit replicas are the commonest choice, but even relatively small companies like Morvélo have been targeted by the bootleggers. I am counterfeit. I am confuse. 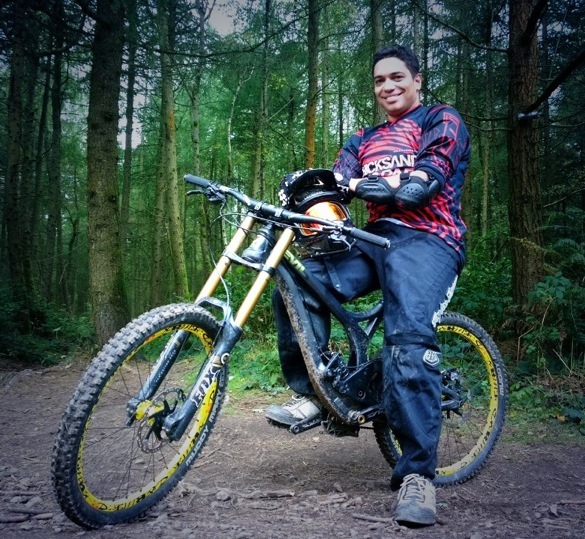 Taking the fight to the counterfeiters costs the bike industry a serious amount of money. Folding bike manufacturer Dahon spends over $200,000 a year on intellectual property enforcement, and clothing company Castelli reckon they challenge 8,000 fraudulent auction listings per month. One of the most proactive companies is Specialized, who employ a team of 15 staff in-house, and claim to stop $15 million of fake goods from being sold every year. But even bigger brands are often forced to rely on websites complying with takedown notices, and the fakers simply pop up again under a different trading account.. 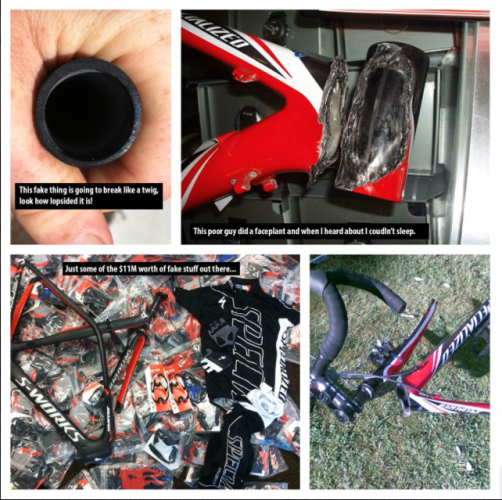 The damage caused to the bike industry is probably secondary in most riders’ minds to the damage that counterfeit parts could cause to their face. Are you genuinely putting your safety at risk if you use a knock-off product? As with much of life, the answer is “it depends”. In the absence of the standards and tests that legitimate products go through, a fake could simply be a worse version of the original, or it could be dangerous. An aluminium stem wrapped to look like carbon fibre could be as strong, or at least more resistant to ham-fisted installation, than the full carbon product it imitates. Knock-off Oakleys have been tested and still block UV-A and UV-B radiation – indeed, it’s hard to get a polycarbonate lens that doesn’t. Counterfeit helmets, on the other hand, are a genuinely dodgy proposition. A copy of a Giro helmet purchased from Amazon was tested on the BBC’s Fake Britain programme in 2014 and found to absorb five times less impact than the genuine article. And a video surfaced a while back of US-based component manufacturer Thomson testing a counterfeit stem, which failed after a fraction of the expected fatigue life. If you buy one of these products, the absence of a warranty could be the least of your worries. After reading the Bikebiz report, we don’t envy anyone in the bike industry who has to take on the counterfeiters. Many companies lack the resources to launch expensive enforcement proceedings in a foreign country, or register their products for intellectual property purposes. In China they’re also up against a culture where copying can be seen as a form of flattery and a way to improve, rather than a way of turning a profit from someone else’s hard work. Ultimately the solution lies with consumers: understand the risks, demand the genuine article, and the trade in fakes will dry up. Cream, Competent or Cowboy – Which factories are faking it? Alibaba and the forty fakers – Who’s retailing the counterfeits? Snap, crackle, and pop – do fake bikes and parts crumple? “I bought a fake” – who’s buying the knock-offs and why? Don’t mess with the mafia – is it dangerous to expose the fakers? On your marques – what can manufacturers do to foil the fakers? One of the worrying things about this as a consumer, is the doubt and scepticism down on the second hand market. Assembling a bike from second hand parts is part of the culture, but now when looking at that used Thomson stem on eBay or the classifieds, as well as looking at the condition in the photos, I’ll also be wondering if it’s a knock off that will fail the day I finally learn to jump.